DARJEELING: With West Bengal chief minister Mamata Banerjee asking the Gorkha Janmukti Morcha to call off its indefinite bandh in Darjeeling within 72 hours, its chief Bimal Gurung threatened a 'janta curfew' if this deadline was not withdrawn. "Mamata Banerjee has to withdraw her statement that the bandh should be withdrawn within 72 hours, or else we will call a janta curfew and the people will remain indoors," Gurung said. Noting that the GJM was not afraid of 'oppression by the state government', he said Banerjee should not have made the statement as chief minister. "The people in the hills are on the streets. 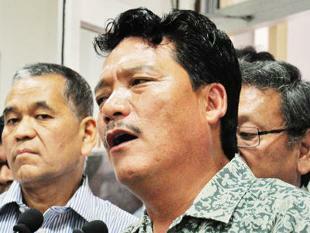 We will continue our movement in a democratic manner," Gurung said. "She has given a deadline of 72 hours. She will be forced to withdraw her ultimatum. The people of the hills are holding a democratic and peaceful movement, but if she tries force, then the people of the hills will give her a fitting reply," said Gurung. "If she feels that by issuing the ultimatum and letting loose her authoritarian rule she can bend us, then she is wrong. We are ready for it."